Part of a new feature at www.grahamhenderson.ca is my "Throwback Thursdays". Going back to articles from the past that have new urgency, were favourites or perhaps overlooked. This article falls into the first category. The real Percy Bysshe Shelley was a political animal for whom politics were the dominating concern of his intellectual life. His political insights and prescriptions have resonance for our world as tyrants start to take center stage, countries retreat into nationalism and theocracies dominate entire civilizations. Dismayingly, the problems we face are starkly similar to those of his time, 200 years ago. For example: the concentration of wealth and power and the blurring of the lines between church and state. Some of you will have read my review of Michael Demson's history of Shelley's Mask of Anarchy. The reason poems like this are so important is that once upon a time the galvanized people to action. And they can again. People merely need to be inspired. As Demson demonstrates, The Mask of Anarchy is important because "unmasked" the true nature of the political order that was crushing England. Shelley's call for massive, non-violent protest was decades ahead of it's time and influenced unionorganizers and political leaders across the globe. But the more things change the more they seem to stay the same. Guest contributor Mark Summers comment on the Mask of Anarchy says it all: "Disgustingly the only thing we need to update from Mask is the cast of villains, the substance is unchanged!." To someone today concerned with issues such as social and political equality, Shelley therefore offers two things; firstly a shocking wake up call to the fact things have changed so little, and secondly a storehouse of remarkably sophisticated ideas about what to do about this. One of the goals of my site is also to gather together people from all disciplines and walks of life who are interested in Shelley. One such person is Mark Summers. One of his stated goals is to "take Shelley to the streets". I hope to have more to report about this later. There has been a long history of this, most recently during the Occupy Wall Street demonstrations. Mark is an e-Learning specialist for a UK Midlands based company and a musician specializing in experimental and free improvised forms. An active member of the Republic Campaign which aims to replace the UK monarchy with an accountable head of state, Mark blogs at at www.newleveller.net which focuses on issues of republicanism and radical politics/history. You can also find him on Twitter @NewLeveller. Mark's writing has a vitality and immediacy which is exhilarating. I first discovered him as a result of the article I am republishing below. It was written for openDemocracy. Mark has gone on to write more about Shelley. I hope this is only the beginning. "I take inspiration from the radical and visionary Leveller movement which flourished predominantly between the English Civil Wars of the mid 17th Century. In a series of brilliant leaflets and pamphlets the Levellers articulated their commitment to civil rights and a tolerant social settlement. I consider the ideals of justice and accountability expressed by this movement to be of continuing importance and their proposed solutions provide valuable lessons for meeting contemporary challenges. Clearly the 21st Century is vastly different to the 17th and it is my aim to apply the spirit of Leveller thinking rather than a simple reiteration of their demands. As such I espouse the aims of Civic Republicanism, church disestablishment along with the pursuit of social equality and inclusion." To that, I say hear, hear! Now, allow me to introduce you to his fast paced prose which betrays great admiration and affection for the work and life of Percy Bysshe Shelley. Imagine discovering a new set of string quartets by Beethoven or a large canvas by Turner that was thought to be lost. In either case, the mainstream media would have been agog, just as they were for the discovery of an original Shakespeare folio in April 2016. So it’s remarkable that the release to public view of a major work by a near contemporary of both these artists on November 10 2015—the poet Percy Bysshe Shelley—was met with an air of such disinterest (The Guardian newspaper excepted). There were brief mentions and some excerpts were read out on BBC Radio 4, but no welcoming comments appeared from government ministers including the UK’s Minister for Culture, Media and Sport. So much for a significant early piece by one of Britain’s most revered poets. 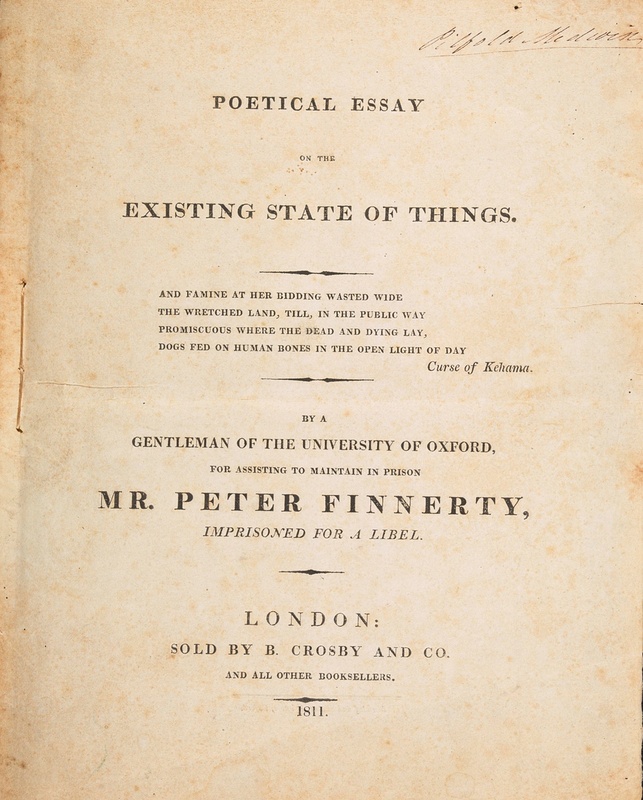 The work in question was a pamphlet by Shelley entitled the “Poetical Essay on the Existing State of Things,” written anonymously in 1811 in support of Irish journalist Peter Finnerty who was imprisoned for libel after criticising the British military command during the Napoleonic Wars. Although a thousand copies of the pamphlet were printed, it is not known how successful the poem turned out to be in terms of raising money; what’s clear is that the work disappeared from view. During the 1870s, some expert detective work positively identified a surviving example of the poem as the work of Shelley. Much more recently in 2006, a single copy was re-discovered by the scholar H.R.Woudhuysen, but it was lodged in a private collection so the work remained hidden from public view. That was the position until 2015, when this private copy was acquired by the Bodleian Library in Oxford. You can now read (and even download) a copy from the Bodleian Library website. Poet and ex-children’s Laureate Michael Rosen had been campaigning for the release of the work for some time previously. In a blog post he gave his thoughts about why, in his words, the poem had been ‘suppressed,’ and why he had campaigned to get it released to the public. Rosen argues that confusing the artistic substance of the pamphlet with the ownership of the physical artifact had meant that only a few privileged people could access the full content—a scandalous situation in his view. What about the pamphlet itself? The Poetical Essay consists of a prose introduction along with a 172 line poem followed by accompanying notes. The nature of the work is clear: it’s a reasoned and passionate response to the perceived ills and injustices of the world by an 18 year old radical. But this range of criticism is, ironically, also a source of weakness in the work. As John Mullen pointed out in The Guardian, Shelley’s targets are hidden behind abstractions. The poem doesn’t deliver the punch of some of his later works such as the sonnet “England in 1819”, and the poem “Masque of Anarchy,” where the focus is on a single event—the outrage of the 1819 Peterloo Massacre. Interestingly, both of these works were also suppressed until the 1830s. Ultimately, the concealment of Shelley’s Poetical Essay highlights a number of important contemporary issues about the values of our own society, including the rights of possession and access to important cultural artifacts. Undoubtedly, the pamphlet contains explosive ideas which the British establishment might continue to regard as dangerous. It would be crass and superficial not to acknowledge that the situation in which Shelley found himself in 1811 is very different from the one we inhabit in the second decade of the 21st Century. Yet in some respects the poet would be depressed to see how certain aspects of social and political life have barely changed. First, the poem was written to help raise money for a journalist—Finnerty—who was critical of Britain’s military commanders and who was imprisoned for libel as a result. With the increasing focus on military issues in Iraq, Afghanistan, Syria and elsewhere can we be sure that important criticisms of the military are not being similarly gagged today? Note how the failures of the British Army in Helmand Province, Afghanistan, for example, have been suppressed, including those highlighted by servicemen who were directly involved. News continues to be managed and the opinions of pacifist ex-servicemen are still marginalised. Second, a central concern of Shelley and other critics in 1811 was the way in which the poor were made to bear the costs of military activity, while the glory and spoils of war were garnered by the establishment. What would his poem say if it were to be written today about the commitment of the UK government to spend two per cent of GDP on the military, or to give tax cuts to the wealthy, or to protect trusts and tax havens while cutting disability benefits, some of which affect ex-servicemen? Finally, Shelley’s concern with the methods by which society can be moved from a position where privilege holds power to one where power is distributed throughout society and held accountable is just as real today. But here he runs into the same problems as everyone else who is seeking radical change. Shelley claimed that the actions he was proposing in his pamphlet did not infringe on the interests of Government, but this was surely naive. Taking power from those who possess it is itself a revolutionary act. He needed to have looked no further than recent history (for him) in the form of the American Revolution for confirmation of this fact. How to achieve peaceful and lasting change in modern societies remains an unanswered question, and one that’s ripe for fresh action and inspiration. Dangerous ideas from poets are just what a genuinely open society should be able to encompass and discuss, not conceal, ignore or suppress. This article originally appeared on 27 July 2016 and can be found here. It is reprinted with the permission of the author and openDemocracy. My thanks to both.